If you met me today, you might think I have always been into bikes, but the truth is, I’ve only been riding regularly for a few years. I can’t really remember what I did before I wanted to ride a bike around everyday, but I vaguely remember that I spent a lot of it smoking. In other words, I have come to ride a bike in New Orleans, where it is flat, flat, flat. I can go out for 30 miles with total elevation gained and lost only around 6 feet (if you don’t know what that means, it means pretty much riding on ground that’s flat as a pancake). But I’m in Idaho right now, and this place has some serious elevation. Oh, and we’re at 5,000 feet. Today’s ride was thus just a teensy bit different from what I’m used to, but oh, it was wonderful. It is empty out here, and there are mountains–I miss mountains. Snow stretches forever, interrupted by the occasional house in old-barn motif or a grocery store. I snapped this picture on our way back home, after I’d already climbed up and down what for me were some serious hills–honestly, I probably gained and lost more elevation today than I do in months and months of riding in New Orleans. How pretty is that expanse of blue? And that road surface? Nope, not in New Orleans anymore. I huffed and puffed my way home, realizing that gears are a dance I don’t know how to do, but I can’t wait to learn, and I’m not in a hurry. Good thing, too, because it’s going to take me awhile to get up that hill. Oh, what a treat to ride my bike today. 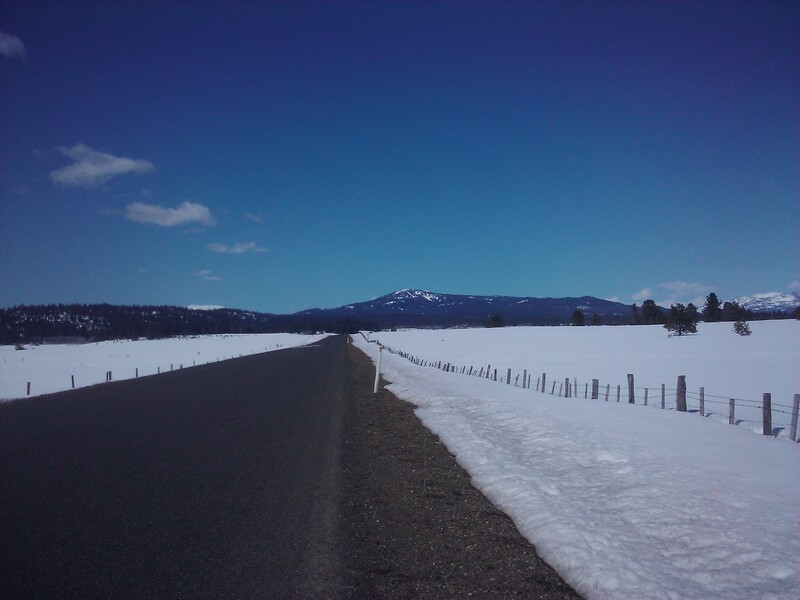 This entry was posted in bikes, weather and tagged blue skies, hills, Idaho, McCall, snow. Bookmark the permalink. Beautiful! Just Beautiful. Thanks for sharing! Whose bike are you riding? I’m riding my stepmom’s touring bike. That’s not my seat, I can tell you that! Beautiful country but I think you are going to feel a little lonely after all the activities of NOLA.